Fritz-Pak Corporation manufactures and sells concrete admixtures that make better concrete, and make construction practices easier and safer. The ultimate goal is to have buildings and structures that are a better value for society. It also teaches and educates construction professionals about better construction practices and the correct use of admixtures, and supplies the construction industry with advanced concrete admixtures in easy-to-use presentations. The company supplies its products to decorative concrete contractors, pool contractors, concrete precasters, ready mix producers, concrete pumpers, and ICF contractors. Fritz-Pak has been a minority-owned small business established in 1998. When Gabriel’s family came up with the idea of pursuing sales in global markets, they sought out private financing—but when a typical export sale is only $10 or $12,000, a local bank isn’t always interested in financing. Even though the company had been exporting for over a decade, it needed assistance to expand sales into new markets. In 2011, EXIM Bank approved a $200,000 insurance policy which helped Fritz-Pak expand to Russia, Taiwan, China, and South Africa. With EXIM’s insurance the Ojedas were able to offer their new foreign buyers credit terms while protecting against the risk of not being paid. Thanks to EXIM, exports now account for about 35 percent of their business—and that export growth allowed Gabriel to rehire those three laid-oﬀ employees. 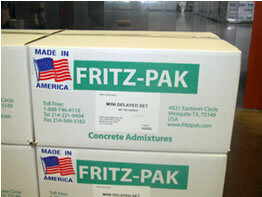 Fritz-Pak proudly displays "Made in the USA" on every box it delivers. EXIM has supported $798,000 of Fritz-Paks export sales during the period 2013 to 2017. The company has expanded into India, Russia, Taiwan, China, and South Africa and foresees increasing the production and office staff to accommodate the additional sales going forward. "Exporting as a small business has always been a risky proposition; even more so in today's financially unstable global economy. With EXIM Bank, I have the peace of mind to expand my business as much as possible while mitigating many of the risks associated with international transactions ... We may be small, but we think big. In an age where everything seems to be made someplace else, we’re thriving here in Texas. Our success is due to hard work, attention to customers’ needs and belief in the future. Yet there’s no doubt this success is also in no small part due to the services provided by EXIM Bank."